I have been asked many times how I use my own font LT Oksana, as a custom font throughout this blog as I do. The answer is simple, with Cufón of course! And I am going to share with fellow user's of the Blogger platform just how to use Cufón in your Blogger blog! 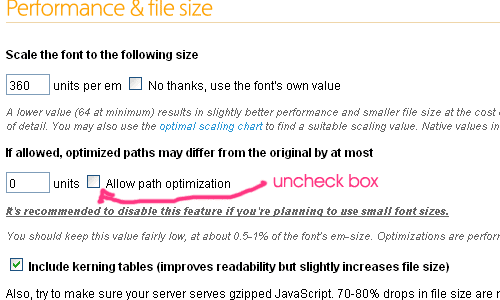 I would also make sure the box next to "Include kerning tables (improves readability but slightly increases file size)" is also checked. It may increase file size, but... if the file is not too large already and the font is well kerned, it might be worth it. It's really a matter of preference or necessity really. Highlighted in green in the code above is the h3 tag. It designates that all occurances of text within an h3 tag are to be replaced with Cufón. I chose to use h3 since in the majority of Blogger templates, h3 tags are used for post-titles. In that case, all post titles will display in the custom font. If you would like or feel capable, add or change this section as desired. Save your new template & then take a look at your blog to see your new custom fonts in action! For more advanced styling options, visit GitHub Styling.